Author contributions: Liu XH, Yang YW and Dai HT contributed equally to this work; Ye ZQ designed research; Liu XH and Yang YW performed research; Dai HT and Cai SW contributed new reagents or analytical tools; Chen RH analyzed data; Liu XH and Yang YW wrote the paper. Institutional review board statement: The study was reviewed and approved by the Institutional Review Board of the Third Affiliated Hospital of Sun Yat-Sen University, Guangzhou, China. Institutional animal care and use committee statement: All procedures involving animals were reviewed and approved by the Institutional Animal Care and Use Committee of the Third Affiliated Hospital of Sun Yat-Sen University, Guangzhou, China. The animal protocol was designed to minimize pain or discomfort to the animals. Conflict-of-interest statement: The authors declared no conflicts of interest in this study. AIM: To determine the potential protective role of adiponectin in intestinal ischemia reperfusion (I/R) injury. METHODS: A rat model of intestinal I/R injury was established. The serum level of adiponectin in rats with intestinal I/R injury was determined by enzyme-linked immunosorbent assay (ELISA). The serum levels of interleukin (IL)-1β, IL-6, and tumor necrosis factor (TNF)-α were also measured by ELISA. Apoptosis of intestinal cells was detected using the terminal deoxynucleotidyl transferase dUTP nick end labeling assay. The production of malondialdehyde (MDA) and superoxide dismutase (SOD) and villous injury scores were also measured. RESULTS: Adiponectin was downregulated in the serum of rats with intestinal I/R injury compared with sham rats. No significant changes in the expression of adiponectin receptor 1 and adiponectin receptor 2 were found between sham and I/R rats. Pre-treatment with recombinant adiponectin attenuated intestinal I/R injury. The production of pro-inflammatory cytokines, including IL-6, IL-1β, and TNF-α, in rats with intestinal I/R injury was reduced by adiponectin pre-treatment. The production of MDA was inhibited, and the release of SOD was restored by adiponectin pre-treatment in rats with intestinal I/R injury. Adiponectin pre-treatment also inhibited cell apoptosis in these rats. Treatment with the AMP-activated protein kinase (AMPK) signaling pathway inhibitor, compound C, or the heme oxygenase 1 (HO-1) inhibitor, Snpp, attenuated the protective effects of adiponectin against intestinal I/R injury. CONCLUSION: Adiponectin exhibits protective effects against intestinal I/R injury, which may involve the AMPK/HO-1 pathway. Core tip: Serum adiponectin was downregulated in the rat model of intestinal ischemia reperfusion (I/R) injury, and adiponectin pre-treatment attenuated intestinal I/R injury in rats. While the underlying mechanism of adiponectin-induced protection against intestinal I/R injury is not fully understood, the results of the present study suggest that the AMP-activated protein kinase (AMPK)/heme oxygenase 1 (HO-1) signaling pathway may be involved in this process. Therefore, adiponectin and components of the AMPK/HO-1 signaling pathway may be promising targets in the treatment of intestinal I/R injury. Intestinal ischemia reperfusion injury (I/R), a critical complication in patients with trauma and after liver and intestinal transplantation, is associated with high morbidity and mortality[1-3]. Interruption of the blood supply may cause tissue damage. However, restoration of blood flow does not relieve tissue damage but leads to additional injury. Previous studies have shown that oxidative stress, the inflammatory response, and cell apoptosis are involved in I/R injury, which leads to multiple organ dysfunction syndrome (MODS) and acute respiratory distress syndrome[5-9]. Extensive research has been conducted to develop effective treatments for I/R injury that regulate oxidative stress and the inflammatory reaction. Adiponectin, also referred to as gelatin-binding protein-28 (GBP28), ACRP30, AdipoQ, or apM1, is a hormone secreted mainly by adipocytes. As a serum protein similar to C1q, adiponectin is exclusively produced in adipocytes. Adiponectin exerts its function primarily via two membrane receptors, adiponectin receptor-1 and -2 (AdipoR1/2), which interact with AMP-activated protein kinase (AMPK) and peroxisome proliferator-activated receptor (PPAR). In addition, previous studies have reported that adiponectin exhibited anti-inflammatory and anti-apoptosis effects and regulated the metabolism of glucose and lipid[11-13]. Interestingly, a number of studies have also reported the role of adiponectin in protection against I/R injury in myocardial, cerebral, liver, and renal tissues[14-17]. However, the effects of adiponectin in intestinal I/R have not been confirmed. The present study aimed to investigate the potential role of adiponectin in protecting against intestinal I/R injury based on a rat model of I/R injury. Rat adiponectin was cloned into the pET30 vector (Novagen, Darmstadt, Germany) as described previously. The DNA constructs were then transfected into competent Escherichia coli BL21 (DE3) (Takara, Shiga, Japan). Isopropyl-1-thio-b-D-galactopyranoside was used to induce the expression of His-tagged adiponectin at 37 °C. Recombinant His-tagged fusion protein was isolated from the cytoplasm and purified using a His Bind resin column (Novagen). All animal experiments were approved by the Medical Ethics Committee of the Third Affiliated Hospital, Sun Yat-Sen University, Guangzhou, China. Female Wistar rats were randomly grouped and underwent surgery to induce intestinal I/R injury. There were five rats in each group weighing 180-230 g. The rats were deprived of food and received only water 12 h prior to laparotomy. The rats were anesthetized by intraperitoneal injection of ketamine (50 mg/kg) and xylazine (5 mg/kg). A midline laparotomy was performed, as previously described, before equilibration for 30 min. The superior mesenteric artery was identified and isolated, and an atraumatic microvascular clamp (Roboz Surgical Instruments, Rockville, MD, United States) delivering 85 g of pressure was used to block blood flow in the mesenteric artery in rats in the intestinal I/R injury group. Intestinal ischemia was identified by the pale color of the intestine. After intestinal ischemia for 45 min, the clamp was removed to allow reperfusion for different time periods. When the color of the intestine returned to pink, the intestine was assumed to be reperfused. At the end of reperfusion, an approximately 10 cm segment of the small intestine 10 cm from the appendix was harvested for follow-up experiments. As a control, the sham group (sham) was subjected to the same surgical intervention but without superior mesenteric artery occlusion. The body temperature of the animals was maintained throughout the surgical procedure using a water-circulating heating pad. Rats in the adiponectin pre-treatment group (IR + adiponectin) received a tail vein injection of recombinant adiponectin at different concentrations (0.25, 0.5, or 1 mg/kg) 30 min before the establishment of intestinal I/R, as mentioned above. To determine the possible pathway involved in the protective effects of adiponectin, the IR + adiponectin (1 mg/kg) group received an intraperitoneal injection of 20 mg/kg compound C (Millipore, Cambridge, MA, United States) or 50 μmol/kg Snpp (Sigma, St. Louis, MO, United States). Serum adiponectin level in rats was determined using a rat enzyme-linked immunosorbent assay (ELISA) kit (R&D Corp., Minneapolis, MN, United States) according to the protocol described previously. Sections of the small intestine were homogenized and the supernatant was collected by centrifugation to measure the levels of cytokines, including interleukin (IL)-1β, IL-6, and tumor necrosis factor (TNF)-α, in intestine tissues. The levels of IL-1β, IL-6, and TNF-α in intestine tissues were determined using a commercial ELISA kit (USCN, Wuhan, China). Small intestine tissues were homogenized in 1.5% cold KCl solution at a ratio of 1:10 (weight:volume). The lipid peroxide level in the supernatant was measured according to the method described previously. Absorbance of the reaction was measured at 532 nm (Shimadzu UV-1700, Kyoto, Japan). The lipid peroxide level was expressed as nmol of malondialdehyde (MDA) per mg of tissue protein. Superoxide dismutase (SOD) activity was evaluated using a commercially available kit (Cayman Chemical, Ann Arbor, MI, United States) according to the protocol described in a previous report. SOD activity was expressed as unit (U) per mg protein. One U of SOD activity was defined as the amount of enzyme needed to inhibit 50% dismutation of the superoxide radical. The small intestine tissues were homogenized and lysed in radio immunoprecipitation assay buffer [50 mmol/L Tris·HCl, pH 7.4, 150 mmol/L NaCl, 1% NP-40, 0.5% sodium deoxycholate, and 0.1% sodium dodecyl sulfate (SDS)] incorporated with phenylmethylsulfonyl fluoride (Forevergen, Guangzhou, China). Isolated total proteins were separated by 10% SDS-polyacrylamide gel electrophoresis and transferred to polyvinylidene fluoride membranes. The membranes were then incubated with primary antibodies and then horseradish peroxidase-conjugated secondary antibodies (Santa Cruz, Dallas, TX, United States). Bands were visualized using an enhanced chemiluminescence kit (Pierce, Rockford, IL, United States). The following antibodies were used in Western blot analysis: anti-caspase 3, anti-AMPK, anti-pAMPK, anti-heme oxygenase 1 (HO-1), anti-GAPDH antibodies (Cell Signaling, Beverley, MA, United States), anti-Adipo 1 (Abcam Inc., Cambridge, United Kingdom) and anti-Adipo 2 (Abcam Inc.). Terminal deoxynucleotidyl transferase dUTP nick end labeling (TUNEL)-positive cells in the sections of jejunum which had undergone ischemia for 45 min and reperfusion for 3 h were detected by TUNEL assay using a Cell Death Detection kit (Roche Applied Science) according to the manufacturer’s instructions. Intestinal mucosal lesions were graded as described previously. Briefly, grade 0 was defined as normal mucosal villi. Grade 1 was defined as the development of subepithelial Gruenhagen’s space, usually at the apex of the villous, often with capillary congestion. Grade 2 was described as extension of the subepithelial space with moderate lifting of the epithelial layer from the lamina propria. Grade 3 was defined as massive epithelial lifting with a few denuded villi. Grade 4 was defined as denuded villi with exposed dilated capillaries, and Grade 5 was defined as digestion and disintegration of the lamina propria, hemorrhage, and ulceration. The data obtained from independent experiments were expressed as mean ± SD. Differences among groups were analyzed by analysis of variance followed by the least significant difference method to determine statistical significance. A P value < 0.05 was defined as statistically significant. The serum levels of adiponectin in rats in the sham group and the intestinal I/R group were determined and compared by ELISA. A gradual decrease over time (1, 2, 3, 6, and 12 h after reperfusion) was observed in the serum level of adiponectin in the I/R rats compared with that in the sham group (Figure 1A). The lowest level of serum adiponectin was detected 3 h after reperfusion. At 12 h after reperfusion, the serum adiponectin level partially recovered. No significant decrease in the expression of AdipoR1 and AdipoR2 was detected in the intestinal tissues of rats with intestinal I/R based on western blot analysis (Figure 1B). The evaluation of intestinal mucosal lesions showed significantly increased villous injury scores in rats with I/R injury (1, 2, 3, 6, and 12 h after reperfusion) compared with that in the sham group (Figure 1C and D). Figure 1 Adiponectin levels in rats in the sham and ischemia reperfusion injury groups. A: ELISA was used to determine the adiponectin serum levels in the sham and ischemia reperfusion (I/R) injury rats. Data are presented as mean ± SD obtained from five independent experiments; B: Western blot analysis of the expression of adiponectin receptor 1 and adiponectin receptor 2 in the small intestine of rats with I/R injury; C: Hematoxylin-eosin staining of the small intestine at different time points after I/R injury; D: Villous injury scores of C. Necrosis was the major damage after intestinal I/R. N: Colon tissue in normal control rat. aP < 0.05 vs sham. To investigate the effects of adiponectin on the production of pro-inflammatory cytokines, the rats were pre-treated with recombinant adiponectin 30 min before laparotomy. The rats were randomly divided into three subgroups, which were pre-treated with adiponectin at different concentrations (0.25, 0.5, and 1 mg/kg). Sham and I/R rats were used as controls. To assess the inflammatory response to I/R injury, the serum levels of IL-6, IL-1β, and TNF-α were measured by ELISA. As shown in Figure 2A, the serum levels of IL-6, IL-1β, and TNF-α in the rats with I/R injury were significantly higher than those in the sham group. In addition, pre-treatment with recombinant adiponectin significantly reduced the serum levels of IL-6, IL-1β, and TNF-α in a dose-dependent manner. Figure 2 Adiponectin attenuated ischemia reperfusion injury in rats. A: The expression levels of IL-1β, IL-6, TNF-α, MDA, and SOD, and the villous damage score. The data are expressed as mean ± SD obtained from five independent experiments; B: TUNEL/Hoechst staining was performed to assess the effects of adiponectin treatment on cell apoptosis. Nuclei were stained with Hoechst (blue staining). Apoptotic nuclei were identified by TUNEL staining (green). aP < 0.05 vs sham, bP < 0.05 vs IR, cP < 0.05 vs 0.25 mg/kg group, dP < 0.05 vs 0.5 mg/kg group. SOD: Superoxide dismutase; MDA: Malondialdehyde. Consistent with the ELISA results, the level of MDA and villous injury scores in the I/R injury group were significantly higher than those in the sham group. Pre-treatment with recombinant adiponectin partially restored the level of MDA and villous injury scores. In addition, the SOD level was reduced in the I/R injury group and showed a decrease in the group pre-treated with adiponectin. TUNEL staining was performed to investigate the effects of adiponectin on apoptosis in intestinal tissues undergoing I/R injury. As shown in Figure 2B, marked cell apoptosis was observed in intestinal tissues in the I/R injury group, but almost no apoptosis was found in the sham group. In addition, intestinal cell apoptosis in the I/R injury group was reduced by pre-treatment with adiponectin. The rats that received pre-treatment with recombinant adiponectin followed by intestinal I/R injury showed a statistically significant decrease in TUNEL-positive cells in intestinal tissues compared to rats with intestinal I/R injury without pre-treatment with recombinant adiponectin. The protective effect of adiponectin against apoptosis of intestinal cells in rats with intestinal I/R injury was dose-dependent (Figure 2B). Taken together, these results suggest that adiponectin was protective against intestinal I/R injury by inhibiting the apoptosis of intestinal cells and the production of pro-inflammatory cytokines. AMPK, AKT, and signal transducer and activator of transcription-3 have been reported to be associated with adiponectin-mediated effects[23,24]. To determine the potential underlying mechanism responsible for the reduction in intestinal I/R injury, the expression levels of AMP, p-AMPK, and HO-1 were determined by western blot. As shown in Figure 3A, no significant difference in phosphorylated AMPK (p-AMPK) expression was observed between the sham and I/R groups. However, following adiponectin pre-treatment, AMPK was active and the level of p-AMPK was increased. No significant change in total AMPK level was found among the groups. Furthermore, the increased level of p-AMPK was partially abrogated by compound C, an AMPK inhibitor. Similar results were also found for the expression of HO-1, which was suggested to be activated by adiponectin in renal I/R injury. Rats administered adiponectin following I/R injury showed a higher level of HO-1 than the I/R group (Figure 3A), which was partially reversed in the compound C treatment group, indicating that the protective role of adiponectin in I/R may be via the AMPK/HO-1 pathway. Figure 3 AMPK inhibition attenuated ischemia reperfusion injury. A: Western blot analysis of the expression of p-AMPK and HO-1; B: Western blot analysis of the expression of cleaved caspase 3; C: The serum levels of IL-1β, IL-6, TNF-α, MDA, and SOD and the villus damage score. Compound C: AMPK signaling pathway inhibitor; Snpp, HO-1 inhibitor. Adipo: Adiponectin; Compo. C: Compound C; The data are expressed as mean ± SD obtained from 5 independent experiments. aP < 0.05 vs sham, bP < 0.05 vs IR, cP < 0.05 vs IR + adiponectin. I/R: Ischemia reperfusion; HO-1: Heme oxygenase 1; SOD: Superoxide dismutase; MDA: Malondialdehyde. In addition, to confirm that the anti-apoptotic role of adiponectin is associated with the AMPK signaling pathway, the expression of cleaved caspase 3 was determined. As shown in Figure 3B, significant upregulation of cleaved caspase-3 was observed in the I/R rats compared with the sham rats. The upregulation induced by I/R was diminished by pre-treatment with adiponectin, compound C, and the HO-1 inhibitor (Snpp). Among these groups, the adiponectin group showed the lowest cleaved caspase 3 level. Finally, as shown in Figure 3C, adiponectin-mediated I/R injury protection was partially abolished by compound C and Snpp. Increased levels of IL-6, IL-1β, and TNF-α, increased production of MDA and SOD, and a higher villous injury score were seen in the IR + adiponectin + compound C and IR + adiponectin + Snpp groups compared with the IR + adiponectin group. These findings confirmed the involvement of the AMPK/HO-1 pathway in the protective role of adiponectin in intestinal I/R injury. Previous studies have demonstrated that adiponectin plays an important role in preventing I/R injury[14-17]. However, whether adiponectin functions in the prevention of intestinal I/R injury is unknown. In the present study, we provide evidence that adiponectin is protective against intestinal I/R injury in rats. IL-6, IL-1β, and TNF-α are important pro-inflammatory cytokines and are regarded as molecular markers of inflammatory responses in human cells. In the present study, increased serum levels of IL-6, IL-1β, and TNF-α were observed in rats with intestinal I/R injury. Interestingly, adiponectin reduced the serum levels of IL-6, IL-1β, and TNF-α in rats with I/R injury, indicating that adiponectin has anti-inflammatory effects in intestinal I/R injury. The production of free radicals and oxidants are dramatically increased during ischemia and reperfusion[7,9,27]. Increased levels of oxidative stress markers such as MDA (an indicator of lipid peroxidation and free radical-induced cellular damage) were observed in I/R injury, accompanied by reduced scavenging ability against oxidative injury, such as low activity of SOD[3,8]. Consistent with previous studies, increased MDA production and reduced activity of SOD were observed in the rat model of intestinal I/R injury. Reduced MDA and increased SOD levels were found in rats with I/R injury that received pre-treatment with adiponectin. These results suggest that adiponectin pre-treatment inhibited oxidant generation, maintaining a higher level of antioxidant activity in rats with I/R injury than in rats without adiponectin pre-treatment. Intestinal villi have been reported to be susceptible to I/R injury and are involved in cellular necrosis. 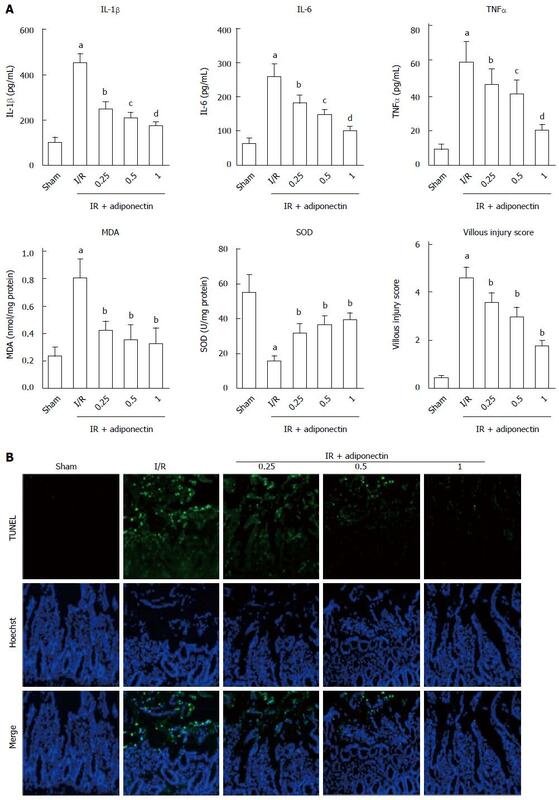 In the present study, we found that adiponectin pre-treatment attenuated villi damage in the rat model of I/R injury, indicating the therapeutic application of adiponectin in intestinal I/R injury. However, the underlying mechanisms should be investigated further. AMPK plays an important role in mediating the production of adenosine triphosphate and fatty acid oxidation. In addition, it has been reported that adiponectin activated AMPK signaling in cat cardiomyocytes in vitro and protected against heart I/R injury in mice via an AMPK-dependent pathway. Based on previous studies, we hypothesized that adiponectin may also protect against intestinal I/R injury through the AMPK signaling pathway. In the present study, an increased level of phosphorylated AMPK was detected in rats with I/R injury that received adiponectin pre-treatment compared to the sham group, which supports our hypothesis. HO-1, also known as heat shock protein 32, is a stress inducible protein involved in the protection against cellular injury. Previous studies have shown that adiponectin upregulated HO-1 expression and exerted beneficial effects in the protection of renal I/R injury[25,31]. It has also been reported that increased HO-1 expression by adiponectin played an anti-apoptotic role in iron-induced liver injury. The present study showed that the expression of HO-1 was increased in rats with intestinal I/R injury and adiponectin pre-treatment. These results support the involvement of HO-1 in cellular injury protection. 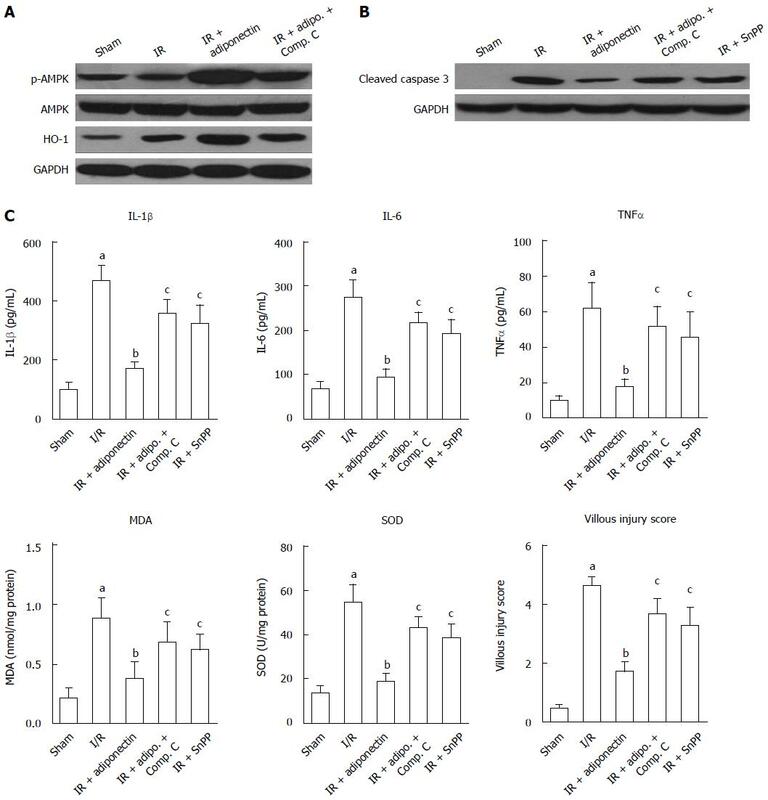 In addition, a previous study suggested that the anti-apoptotic effect of AMPK mediated by HO-1 may provide an important adaptive response to preserve endothelial cell viability during metabolic stress. Here, we found that the expression of p-AMPK and HO-1 was inhibited by compound C, suggesting that the AMPK-HO-1 signaling pathway was involved in the protective effects of adiponectin against intestinal I/R injury. AdipoR is involved in various biological effects of adiponectin, and is closely related to obesity, diabetes, and cardiovascular disease. In different tissues, the expression levels and the regulating factors of AdipoR are different. 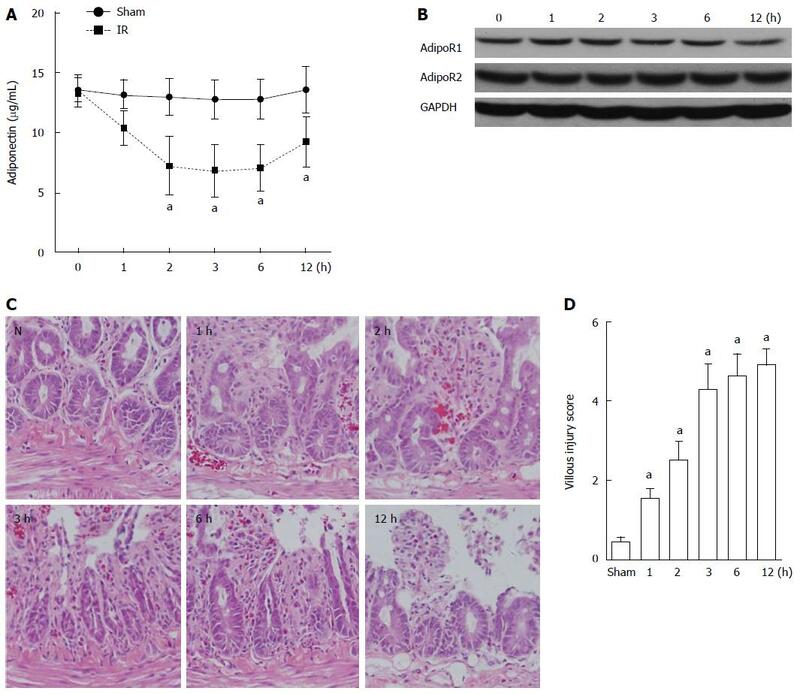 Adiponectin receptor expression is elevated in colorectal carcinoma but not in gastrointestinal stromal tumors. The expression of placental adiponectin is increased during pregnancy in the rat, while Adipo R2 shows the opposite pattern. In this study, protein levels of Adipo R1 and Adipo R2 in the I/R and I/R + adiponectin groups did not change significantly, while p-AMPK and HO-1 increased in the I/R + adiponectin group compared to the I/R group which are consistent with the results of Chen et al and Cheng et al. However, it is unclear whether it is Adipo R1, AdipoR 2, or their combination that have an effect on the protein level of p-AMPK and HO-1. Perhaps the function of AdipoR is not dependent on the protein level in intestinal I/R injury. In the future, we intend to conduct experiments to understand further this mechanism. In summary, we showed that serum adiponectin was downregulated in the rat model of intestinal I/R injury, and adiponectin pre-treatment attenuated intestinal I/R injury in rats. While the underlying mechanism of adiponectin in protection against intestinal I/R injury is not fully understood, the present results suggest that the AMPK/HO-1 signaling pathway may be involved in this process. Therefore, adiponectin and components of the AMPK/HO-1 signaling pathway may be promising targets in the treatment of intestinal I/R injury. It has been reported that adiponectin protects against ischemia reperfusion (I/R) injury in several tissues. This study aimed to determine the potential protective role of adiponectin in intestinal I/R injury. Previous studies have shown that oxidative stress, the inflammatory response, and cell apoptosis are involved in I/R injury. Interestingly, a number of studies have also reported the role of adiponectin in protection against I/R injury in myocardial, cerebral, liver, and renal tissues. However, whether adiponectin functions in the prevention of intestinal I/R injury is unknown. This study showed that serum adiponectin was downregulated in the rat model of intestinal I/R injury, and adiponectin pre-treatment attenuated intestinal I/R injury in rats. While the underlying mechanism of adiponectin in protection against intestinal I/R injury is not fully understood, the results of this study suggest that the AMP-activated protein kinase (AMPK)/heme oxygenase 1 (HO-1) signaling pathway may be involved in this process. Therefore, adiponectin and components of the AMPK/HO-1 signaling pathway may be promising targets in the treatment of intestinal I/R injury. Adiponectin and components of the AMPK/HO-1 signaling pathway may be promising targets in the treatment of intestinal I/R injury. Intestinal I/R injury is a critical complication in patients with trauma and after liver and intestinal transplantation, and it is associated with high morbidity and mortality. Adiponectin, also referred to as gelatin-binding protein-28, ACRP30, AdipoQ, or apM1, is a hormone secreted mainly by adipocytes. The title is short, conclusive, and reflects the content of the study. The abstract is clear with obvious delineation between the various parts.